Since 1957, the New Britain Civic Association (a 501c3 charity) has owned and operated Covered Bridge Park, a 14.7 acre park open to the public. 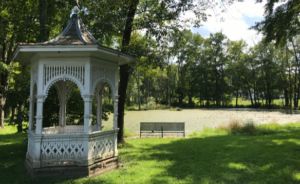 Tucked away along Pine Run Creek in New Britain Borough, the park features a playground, a picnic pavilion, a soccer/baseball field, a gazebo and a pond. The park is a focal point for outdoor recreation for area residents. Click here for directions. Covered Bridge Park is a regional park bounded by New Britain Borough, New Britain Township and Doylestown Township. For more information, please check out the Civic Association’s website. In 2013, New Britain Borough purchased 5.5 acres of land adjacent to Covered Bridge Park on Keeley Avenue. Orchard park is intended for lower impact recreation than its neighboring park. In addition to a community garden, the park includes an orchard, woods, and wetlands. Suitable habitats have also been created for native wildlife such as birds, owls, bats and honeybees. Both Orchard Park and Covered Bridge Park share several facilities with one another including parking, water, and restrooms. Click here for directions. Orchard Park is under the supervision of the Parks and Recreation Committee. To learn more about the park and its intended uses, please refer to the Orchard Park Strategic Plan. 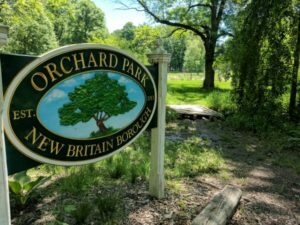 New Britain Borough’s Community Garden is located within Orchard Park on Keeley Avenue. 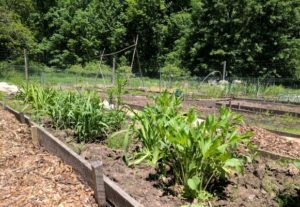 The garden was started in 2013 by residents interested in participating in the pleasures of growing vegetables, fruits, and flowers in a shared environment. It continues to exist as a combination of individual and community growing areas for either personal consumption or contributions to the New Britain Food Larder. Visitors are encouraged to walk the garden paths and enjoy the serene atmosphere. Click here for directions. The garden is deemed organic only and requires a small annual participation fee. Borough residents are given first priority, although anyone interested may purchase a plot. If you are interested in caretaking a plot, please contact us. 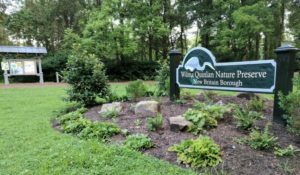 The Wilma Quinlan Nature Preserve is a 26+ acre natural area located along the Neshaminy Creek that is owned and maintained by New Britain Borough. The woods and fields of the Preserve are set aside for habitat preservation and passive recreation. The Preserve’s numerous trails are intended for nature study, wildlife observation, and birding. The Preserve includes “Miriam’s Meadow” a 2.7 acre wildflower meadow on the former property of Miriam Groner, donated to New Britain Borough in 2005. Click here to learn more about the Nature Preserve’s history (PDF). You can also click here for another informative essay on the history of the Preserve by Susan Charkes. The main entrance to the Nature Preserve is located on Mathews Avenue which must be accessed using Sand Road off of Butler Avenue due to a traffic barricade. Another entrance exists near Miriam’s Meadow on Landis Mill Road, although parking is extremely limited. Both are an easy walk from SEPTA’s New Britain Train Station located on Tamenend Avenue. Click here for directions. The Nature Preserve is overseen and maintained by the Nature Preserve Committee. Borough volunteers also help to maintain the preserve on scheduled work days.